Jack and Ryan were concerned because Uncle Jake was coming to visit, and they didn’t want Doom Clown to ruin their fun with him. Behind the door, Doom Clown stood with a knife, ready to surprise him. Jack opened the door, and the two brothers quickly dragged Jake through the living room into their bedroom closet. Both boys embraced their uncle. At that moment, there was a scream. Autumn, the boys’ little sister, was in trouble. Or so they thought. They ran to her bedroom and found Doom Clown, seated at her bureau, screaming like a girl. Autumn was putting makeup on him, making him look like a princess. Doom Clown looked pretty. And terrified. “That’s a HIM?” Jake said. “Fat chance, suckers!” Doom Clown said. He pressed a button on his watch and disappeared in a cloud of smoke. “Oh, no, he escaped!” Ryan said. “Ha, ha, ha!” Doom Clown said. But when the smoke cleared, they realized he hadn’t escaped at all. He was stuck. In the mirror. “Maybe, this time,” said Doom Clown. The mirror swirled in smoke and his face faded in the darkness. On the day of the camping trip, Marshall arrived at the home of his ex, Lauren, and instead of his usually jubilant 6-year-old daughter greeting him, a pensive young investigator sat on a stool in the middle of the living room with a note pad and pen in hand. She pointed at the couch; her father did as directed. “How can I help you, miss?” Marshall said, struggling to hide his amusement. Autumn crossed her legs and remained silent. Lauren explained. An argument erupted the day before in Autumn’s kindergarten class after a student lost his pencil, and Autumn suggested a fairy might have taken it. A boy in the class responded that there were no fairies, nor Santa Claus nor Easter Bunny, for that matter. A girl, offended, insisted the boy was mistaken; she claimed to have seen a fairy herself. The class quickly divided in two camps, the Believers and Non-Believers in a world of magic. Meanwhile, Autumn’s faith had been sufficiently shaken, so much so, in fact, that before her father arrived that morning she created a survey that she intended to use to interview the adults she knew to determine if her favorite mythical creatures were real, or not. Autumn already completed her interview with her mother. Next was her father. “I believe in you, don’t I?” Marshall said. Marshall glanced nervously at Lauren; Lauren smiled. Autumn raised her eyebrows suspiciously, but after further consideration she interpreted her father’s comment in the affirmative. “Oh, all right,” Autumn said, and she disembarked from the stool, shoulders slouched, and harrumphed her way to the door. Autumn kissed her mother goodbye as her father loaded her into her car seat, survey still in hand. As the car ride began, Autumn switched back into investigator mode and greeted Chloe, her father’s girlfriend, seated in the front passenger seat. They were on their way to a forest up north that Marshall promised would be unlike any Autumn had ever seen, but she was skeptical. If there were no fairies or Santa Claus or Easter Bunny in the world, what else was left that could be so special? Autumn mulled the implications of such an existence as she, Marshall and Chloe meandered in the car up the coast. They had been driving forever, it seemed, and Autumn felt tired as the sun receded beyond the dark blue Pacific outside her window. The car entered a tunnel as Autumn started to doze. The car emerged from the tunnel: what a forest, indeed! There were fields of flowers that resembled sugar cookies, trees made of lollipops, mountains covered in whipped cream. Bob the Mystic Frog was driving, and El Papa, the immortal potato, sat in the front passenger seat. The Troll from Autumn’s birthday party sat next to Autumn in the backseat. Everyone was in good spirits. They stopped at a fueling station, and some gummy bears ran out of a garage, grabbed a pump and filled the tank with liquid licorice. The passengers stepped out and stretched. Autumn surveyed the area, and noticed white frogs bellowing from creeks made of orange soda, blue birds soaring through a pink sky that smelled like cotton candy, and little bunnies hopping to and fro. 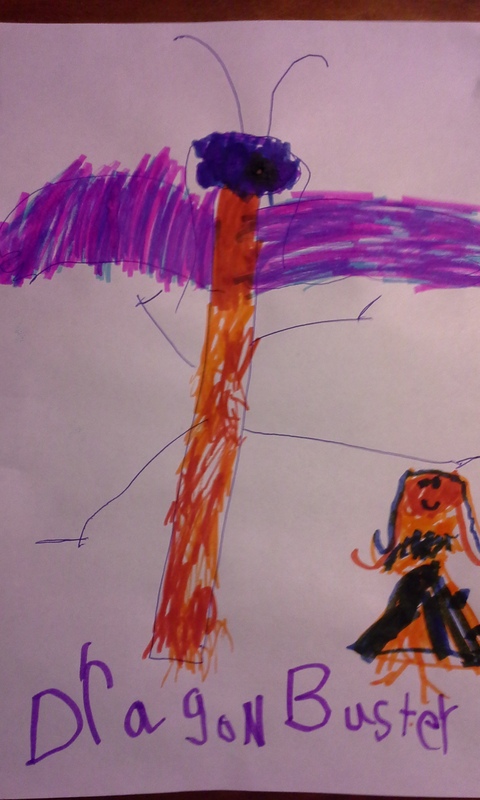 Then, a horrifying sight: a dragon, purple and menacing, appeared overhead. It zigzagged its way across the sky in a strangely logical fashion, exhaling grayish smoke that formed circles, rectangles and triangles. Stranger still, the dragon’s eyes were closed. It began to cry out in fear and anger and rained fire on the enchanted wilderness below. “Run!” the Troll said, and Autumn, her friends and the gummy bears huddled together inside the fueling station. When the rain of fire ceased, Autumn and the others stepped outside and assessed the damage. Many of the lollipop trees were scorched; some of the sugar cookie flowers were wilted. The frogs, birds and bunnies remained in hiding. Reluctantly, one by one, the mythical creatures of the forest followed Autumn’s cue and again revealed themselves. Autumn and her friends waved goodbye to the gummy bears. Bob directed the car back to what he believed was the tunnel through which they came, and Autumn was suddenly thrilled at the prospect her nightmare soon would end and she would be reunited with her father and Chloe again. But that’s not what happened. Bob was a lousy driver, and the tunnel they entered was not a tunnel at all, but a cave. Deep into the cave they drove, until at last the car’s lights shone on the closed eyes of a dragon slumbering peacefully. “I’m scared!” the Troll said, clinging to Autumn in her car seat. “What should we do?” Bob said. “That’s what you said about the forest, and look where that got us!” the Troll said. With note pad and pen in hand, Autumn disengaged herself from her car seat, opened the door and stepped before the snoozing dragon. Her friends watched, mesmerized, as she sat on the ground, Indian style, and proceeded to ask the terrifying monster a series of questions. “Do you believe in mountains covered in whip cream?” Autumn said. No response from the dragon, only snores. Still no response, just more loud breathing. As Autumn stood to leave, the dragon opened its eyes. They were as green as her own. “He must have been flying in his sleep,” Bob said. “We forgive you, and I am sure the forest animals will, too,” Autumn said, and she hugged the dragon’s nose. She returned to the car. As the car exited the tunnel, Autumn startled awake. Her father was behind the wheel, and Chloe was curled up next to him. The sun’s last rays shone through a beautiful forest. They were surrounded by trees taller than any building Autumn had ever seen, with trunks so red and leaves so green that Autumn thought she was on another planet. But she wasn’t. She was home, on Earth. “Pretty awesome, hey?” Marshall said. It was true, Autumn thought, even if it were a planet without dragons, or at least any she could see. Autumn was a born treasure hunter. Not long after she learned to walk, Autumn began scouring the ground in search of shiny objects: buttons, coins, rocks and sea shells were among her favorite findings. For a while, Autumn tried to eat her treasures, but in time, as she grew from toddler to girl, she learned such behavior was neither acceptable nor desirable. When it came to fine dining, Autumn realized she preferred fries over pennies any day. However, Autumn’s steps toward maturity didn’t stop her from collecting the odd things discarded by everyone else. By the time she began kindergarten, Autumn’s “treasure chest,” as she liked to call it, consisted of a shoe box brimming with a wealth of trinkets collected in her day-to-day travels from home, school, park or beach. With each figurine, key, pebble or ring Autumn discovered, she liked to recount the story of its unearthing. She was also known to sometimes embellish her tales and attribute magical qualities to the items she found. “Where did you get this?” said Marshall, Autumn’s father, one morning as they prepared to depart for school. Marshall held up a small, stitched tie-dyed sack that crumpled in his grip. Marshall demonstrated how to kick and catch the Hacky Sack with the top of his foot, and he and Autumn practiced passing it back and forth to each other with their feet. “Shouldn’t we get going?” said Chloe, Marshall’s girlfriend. As Autumn put away the contents of her shoe box, her father absent-mindedly pocketed the Hacky Sack. It was Work Day at school, where members of the community volunteered to help beautify the campus. Autumn’s class was gathered at the school garden, where Autumn and her fellow classmates worked alongside their parents weeding and tilling the soil before the spring planting. “Look what I found!” a boy said, unearthing a caterpillar. Several of the boy’s classmates, including Autumn, gathered around him. They took turns admiring and petting the green bug. “What should I do with it?” the boy said to their teacher, Jay. The boy did as suggested and returned the caterpillar to the soil. Not long after, another classmate found another caterpillar. “Look what I found!” she said. Several of the girl’s classmates, including Autumn, gathered around her. “What should I do with it?” the girl said to Jay. The girl did as suggested and returned the caterpillar to the soil. Autumn and her classmates continued weeding and tilling. Marshall and Chloe were knelt side by side, pulling weeds and amused in the pleasant work, sunshine and small talk with the children when they noticed a squabble underway. “Put it back!” a boy shouted. “Yeah, put it back!” a girl said. Marshall glanced up from the soil and noticed Autumn surrounded by her classmates. He walked to the circle, and the crowd of children parted. “Autumn found a caterpillar, and now she won’t let it go!” the boy said. “She’s not listening to what Teacher Jay said!” the girl said. “Autumn, what’s the problem?” Marshall said. Autumn opened her cupped hands; languishing inside was a green caterpillar. “That’s a beautiful little creature, isn’t it?” Marshall said. “What do you plan on doing with it?” Marshall said. “I want to take it home and add it to my treasure chest,” Autumn said. Marshall knelt before his daughter, gazed in her eyes. He spoke as softly as possible. 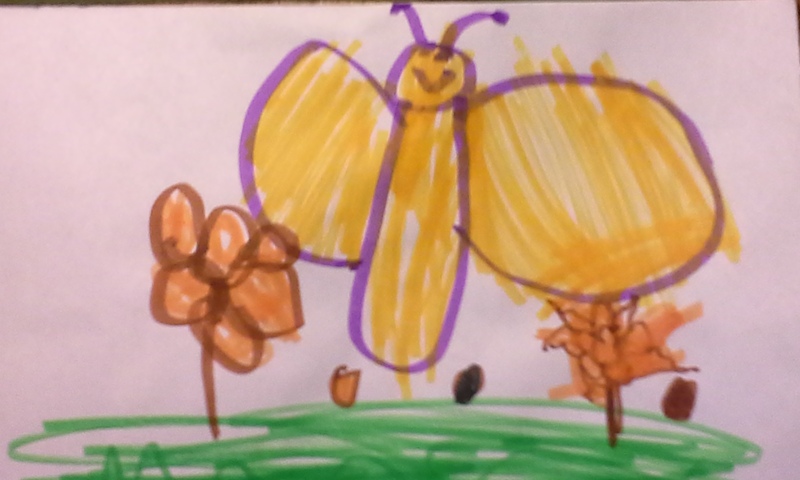 “Okay,” Autumn said, and she slowly put the caterpillar back into the soil. “Nice job, sweetheart,” Marshall said, and he stood. He glanced at Autumn’s classmates surrounding her, and he had an idea. Marshall pulled out the Hacky Sack and winked at Jay; Jay gave Marshall the thumbs up. “How many of you have ever played with one of these before?” Autumn’s father said. Autumn was the only one to raise her hand, so Marshall offered to have him and her demonstrate. Soon, Autumn’s classmates joined them, and they took turns passing the Hacky Sack to one another. No one mentioned the caterpillars again. Then, a few months later, Marshall picked up Autumn one day from school, and she and her other classmates rushed him and the other parents toward the school gardens. There were herbs, vegetables and flowers. There were also beautiful white butterflies, fluttering freely.